Provide the children with a simple turkey body to cut out or one already cut out. Provide the children with different color feathers already cut out with the letters in their name printed on each feather. Have them glue the body to a piece of paper and then glue the feathers on in order of their name. You could provide a name card if the child does not know how to spell their name yet. I sent a picture of a turkey home for the children to decorate with their parent’s help. They could decorate it any way they wanted but were told to be creative. I got lambs, cows, elephants, people and all kinds of ideas back. The parents loved it and it made a great bulletin board. my children love to make Tootsie Turkeys. my parents loved to save them. as a new mommy, I loved getting one myself!! press foot onto a paper, with toes pointing down so the heel will be the turkey head. glue on some fall colored feathers (paper or craft feathers) just above the heel of the footprint. when dry use markers or construction paper to make the eyes, beak, and waddle. They are such an adorable keepsake! Trace each child’s foot (in the shoe) and both hands. Have them cut them out, or for younger children, you can do it for them. 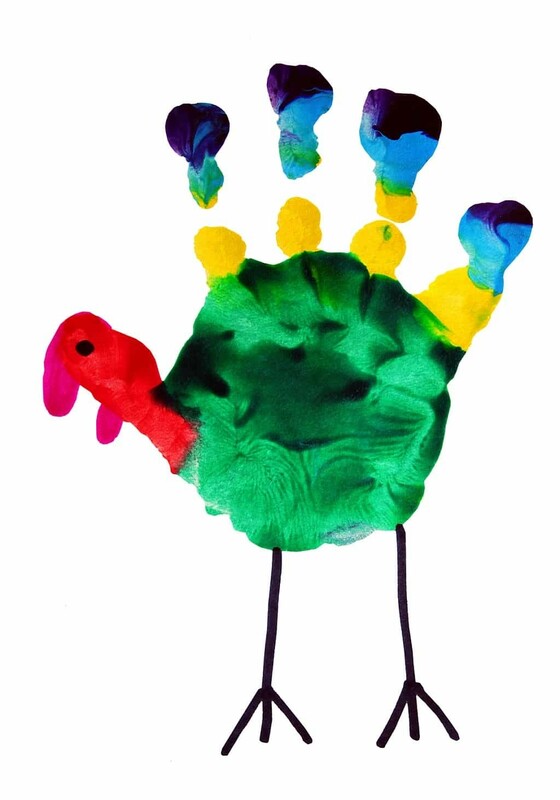 Have the children assemble their “turkeys” by gluing the handprints onto the back of the footprint with the fingers sticking out like feathers. Ask each child what he/she is thankful for and write responses on the turkey. This is a great keepsake for parents! Have the children bring in brown gloves (the inexpensive stretchy kind) most parents will send in the pair so you will have extra. Then have the children stuff a glove with craft stuffing. Then help them push in the bottom so you can glue an oval piece of cardboard to the bottom and your turkey should stand up. Then have pre-cut felt feathers for them to glue onto “fingers’. A beak and googly eyes and a hat if you like. This is adorable when finished. Can be used as a centerpiece of their family table. Have an outline of a turkey on a brown piece of construction paper. Decorate the turkey with cereal, beads, pasta, feathers, or have each child bring something from home to share in the decorating. Each comes out so different, and each child can tell you which one is their’s when hung up!! paint child’s palm of the hand and thumb brown, paint each finger a different color (red, yellow, orange, purple) have child gently place hand in the middle on top of a half sheet of folded paper. A mixture of a few other ideas. I had my class dip their both hands in brown paint and then sprinkle red and yellow glitter over the “feathers” while they were still wet. To finish the turkeys I added a small black eye and a red warbler. While they were drying the students rolled 1″ paper towel tube rings in fall colored paint. When everything was dry I glued the turkey to the ring. The students had their very own napkin ring and one to share. They were SUPER cute!!! Take a lunch size paper bag and fill it with foam peanuts or shredded newspaper. Fold down the front and tape it underneath. Give each child a piece of brown pear-shaped paper, a piece of red paper (cut to look like the turkey’s waddle), two white circles for the turkeys eyes (I let the kids color in the white to give the turkey an eye color), and an orange diamond shape for the turkey’s beak. Once the kids glue that all onto the turkey body have them glue some multi-colored feathers on the flat part of the paper bag. I used construction paper and cut out feather shapes. Finally, flatten the folded part of the bag and glue the turkey body on. Glue on two long orange stripes of paper folded accordion style, and yellow feet to the ends and they have long dangly turkey legs. My kids loved this. Small note: I cut out way too many feathers. They got tired after gluing about 5 feathers. I put a big turkey up on my bulletin board with help from my kids. I first made a pear-shaped turkey and then I traced each child’s hand 6 times to make the feathers. I used fall colors and I also put the child’s picture on their handset so they could see themselves and their other friends. The kids all think it is really cute and so do the teachers.